Sunday breakfast and some of your Board Officers were still at work. Pictured above are (Left to Right): VP Roy Mantei and his wife, Polly, and Treasurer Alma Villezcas, discussing membership and finances. All were guests at the EAA Chapter 555 monthly breakfast event on Father’s Day. 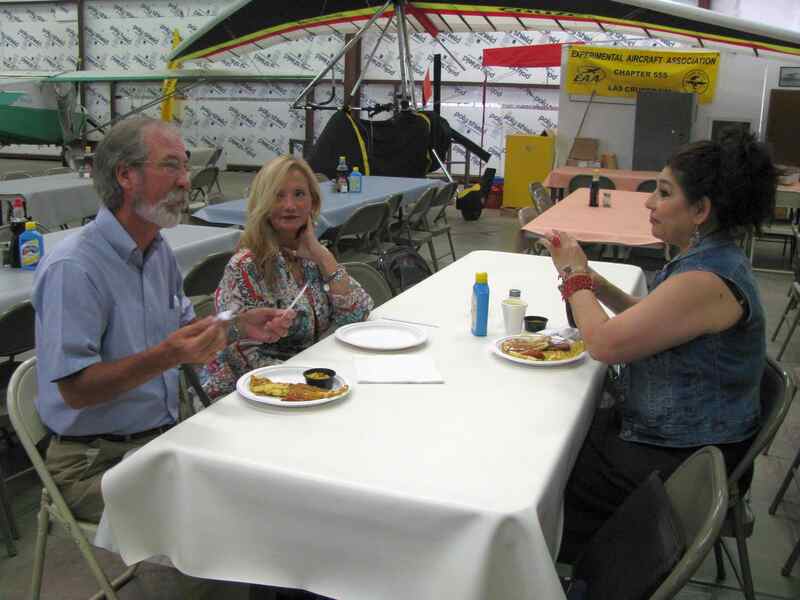 Later in the morning some 200 visitors arrived to enjoy the pancake breakfast and take rides in some of the member’s aircraft. Astronaut Frank Borman, of Apollo 8 fame, flew his own plane down from Montana to visit his old Chapter 555 friends the day before this open house gathering. The chapter is housed in Colonel Borman’s old hangar at the Las Cruces Airport. This chapter is one of the most actively productive in the over 2000 chapters of the EAA internationally. Many of its active members are also members of the FASF. Aerodrome Staff photo.